A nice remodel especially if you want to get a little way away from the town and enjoy the backcountry. We enjoyed going to the end of the street and being able to take our husky for long walks, and my husband even took him out for cross country skiing. I don’t know who loved it more, us, or our husky! It was also an easy enough drive to Heavenly, Stateline, and Sierra-at-Tahoe. Pinnacle was quick to respond to a question about the hot tub. No problems overall. Bath rooms could use a little more updating, but served our purposes well. Took multiple tries to get the lock box locked again, but finally got it. Overall, a great stay, and would return in the future to this home. All new furniture in the living room--purchased in January of 2019! 2. The cabin was clean and stocked with enough towels, blankets etc and some toiletries. 3. The woods behind the cabin is a nice and peaceful spot to sit down for a quiet morning or unwind for the day in the evening. 1. Kitchen is tiny, especially when you have a large group of people. 2. Driveway is too small to park more than 2 cars. 3. The bathrooms in the cabin require see upkeep. The shower in one bathroom was sagging downwards, it seemed like the floor underneath it had rotted. The shower settings are weird, it's hard to figure out what is hot and what is cold. Property Managers were professional and kind and the cabin was absolutely perfect! Stocked beautifully and we loved the hot tub too! 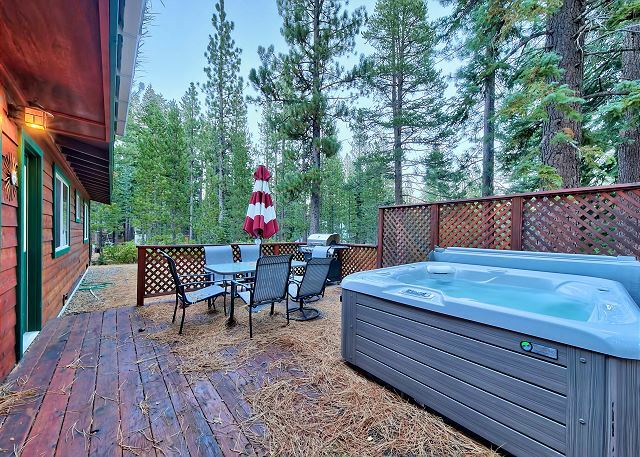 We will definitely rent again on our next trip to gorgeous Tahoe! Thank you, we are glad you enjoyed your stay. This was a great cabin for our family. Everything was clean and well stocked with everything that we needed. Hot tub was very nice and got used nightly. Very quiet neighborhood. There’s stores and anything else you’ll need to buy with a quick 10-15 minute drive into town. The staff at Pinnicle was very friendly and helpful with any question that I had. Check-in instructions were very thorough and easy to follow. Can’t wait till the next trip! a guest from Livermore, CA does not recommend this vacation rental. The property was ok for our short visit. We stayed there over our kid's spring break for spring ski at Sierra at Tahoe. (First week of April). It is about 15 min. drive from the ski ground and convenient location. We are glad we bought all the food and beverages before we approached to the area because there's no large grocery stores near by. The biggest reason we booked this place was the hot tub, which was great! Good temperature, big enough for the family of 5. We loved the cleanliness of kitchen, bathrooms, bed linens, etc. All the tableware and cookware are sufficient and served their purpose. The email instructions were very detailed and easy to understand how to use the key box and the spare key location was easy to find. One thing depends on your cellphone carrier you may have a bad reception to read the email instruction, so we had to drive back to the highway to download and screenshot the email instruction. I could have used WiFi? but the password was also in that email!. We'd definitely recommend this place to my family friends and hope we come back with our friends and extended family as well. Thank you, so glad you enjoyed the Bear's Den and hope you stay with us again. The Bear's Den was a great getaway for us. We were three families with young kids and the cabin didn't feel cramped at all. There was a storm the day before so fresh snow on the ground when we got there. The large backyard was a favorite for the kids wanting to play in the snow. 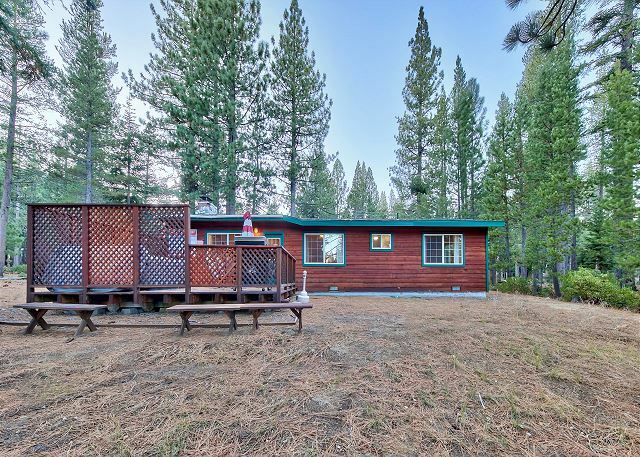 Centrally located, the cabin was close enough to the ski resorts (15 min to Sierra at Tahoe) yet far enough removed for a quiet evening. Lira's supermarket less than 10 minutes away for quick trips to the store. Will definitely recommend to friends looking for a similar experience. 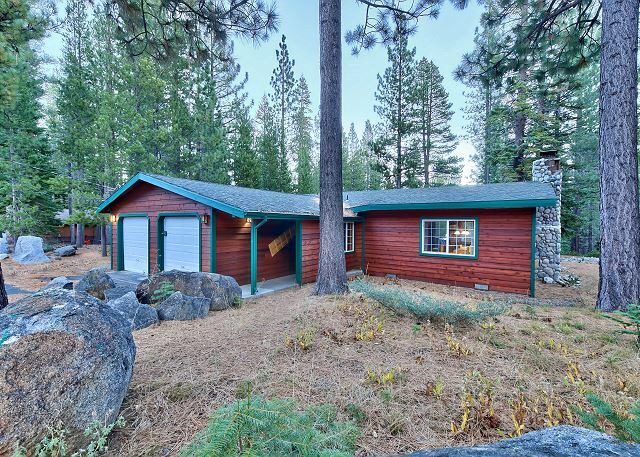 This place is a perfect Tahoe home away from home. 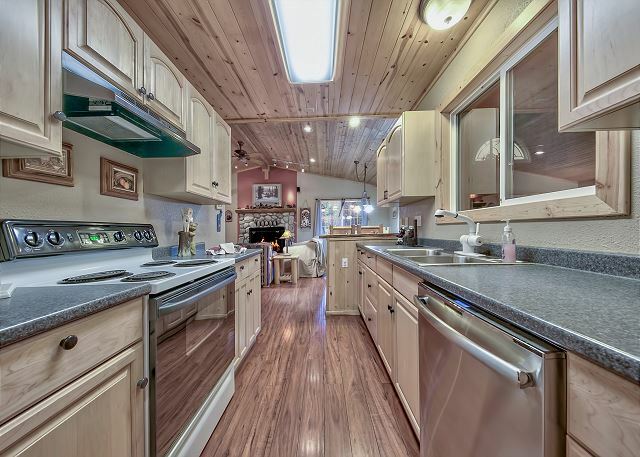 It's clean and cozy but spacious, and comes with all the amenities of home. The dining table is the perfect place for dinner gatherings or evening games, and the big fireplace warms the room and creates a magical ambiance. 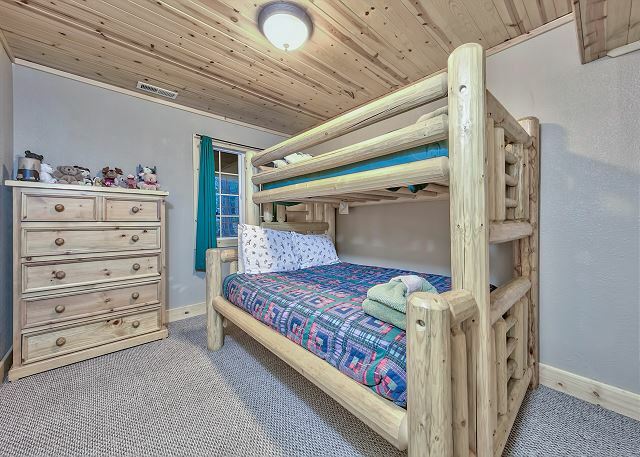 The bedrooms are big and the bunks are great for the kiddos. And the hot tub is an added bonus! Great way to relax in the afternoon or under the stars at night. 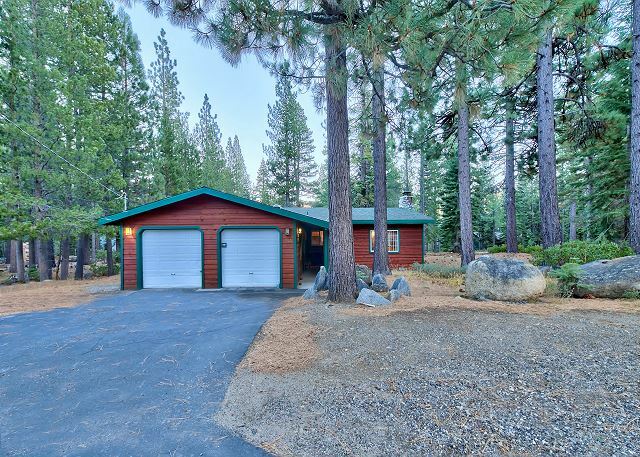 The location may not be ideal for all (it's close to Sierra but not near Heavenly or the casinos) but it's quiet and only about a 20 minute drive to Stateline. I love this place and highly recommend; can't wait to go back! Thank you-we hope you stay with us again. So great to stay at the Bear's Den! Super close to town, beautiful trails to hike in the snow, big house to feel like we all had enough space and an amazing fireplace. Would absolutely stay here again. Thank you! We hope you stay with us again-we may even have snow next time. We really enjoyed our stay here. The only issue was that one of the beds (the sofa bed) was very uncomfortable and really not suitable for sleeping in. There were also no sheets available for this bed. Luckily our group of 7 was able to manage comfortably with the other beds that were available. Thank you for the notes, will look into replacing the sofa bed (unfortunately pull out couches are usually uncomfortable) and yes sheets will be in the linen closet. Our stay at the Bears Den was amazing. My family and I will definitely be there again in the future. Thank you! You are welcome back any time. My party, which included three toddlers and their parents, had a WONDERFUL time at The Bear's Den. The house is well-sized and perfectly appointment. 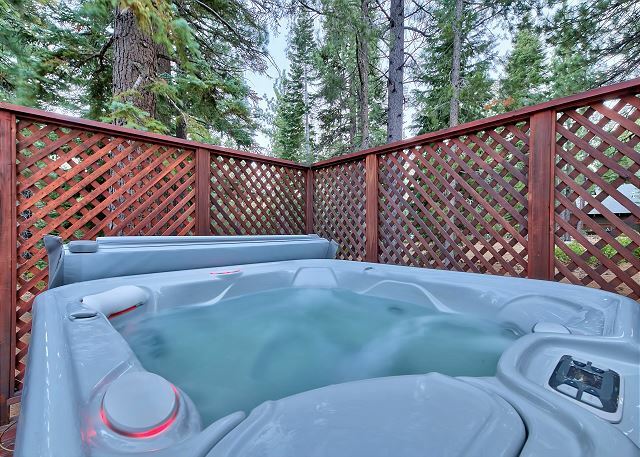 We loved the hot tub, and the house is perfectly situated (far enough from South Lake to avoid the crowds, close to the ski resorts and hiking). We also had fantastic interactions with the management team (Beverly and Michelle). We look forward to returning soon! Thank you! We hope you stay with us again, call directly as we do offer mid week and repeat guest discounts. Thank you so much for this beautiful experience at The Bear's Den it was our son's birthday and we had a great time we are glad that we found this nice and cozy place to expend a weekend with our family. I'm sorry our review is late but the holidays and work make our days so busy we love this place and we would hope to come back. We came at the perfect time when there was snow every where and the kids could make a big slide to play. I recommend this property for future vacations The Bears's Den Cabin is a place that it has everything you need the kitchen is equip the rooms are cozy there's a nice Jacuzzi the living room is big and it has a pool table. Thank you again for this beautiful time.